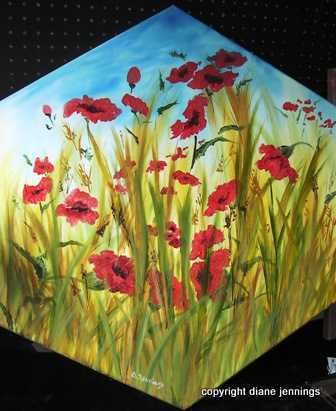 An unusual shape canvas,but it works well for the subject ..You can almost see the poppies moving in the gentle breeze.. I have used high quality oils on an hexagon shape canvas. All of the sides are painted and it has been varnished to protect it. Reduced by £45 It is strung and ready to hang. I will be donating 25% of sales to the O'Connor Cancer Unit at the Royal Shrewsbury Hospital where my son is being treated.